Minuteproject promotes updatable code as one integration technic. What it means is that you can change the generated code AND your modifications will be kept if you generate again (ex when your model change). So this as the interesting effect, that minuteproject is not only for bootstrap time (the early age of your project) BUT throughout the lifecycle of your project. Things change: code and model but it's OK you can still keep the power of reverse-engineering without losing your code. Concretely, what does it mean when working with Minuteproject 4 Openxava? You have a idea, model it! the DB way (do not lose the power of your RDBMS)! If you open a prompt on your generated code directory and set/export your 2 environment variables MP_HOME and OX_HOME then you can call build-. This will create an OX project; build it, deploy it and open your browser to a menu to access your model. This is fine and described to create OX project. Enable your minuteproject to work and merge updated code. You can check your OX classes and xml, they contain comments. Some comments are for modification MP-MANAGED-UPDATABLE-BEGINNING-DISABLE to change to MP-MANAGED-UPDATABLE-BEGINNING-ENABLE when modifying the area. Now you just have point Minuteproject 4 Openxava generation towards you Openxava workspace project. 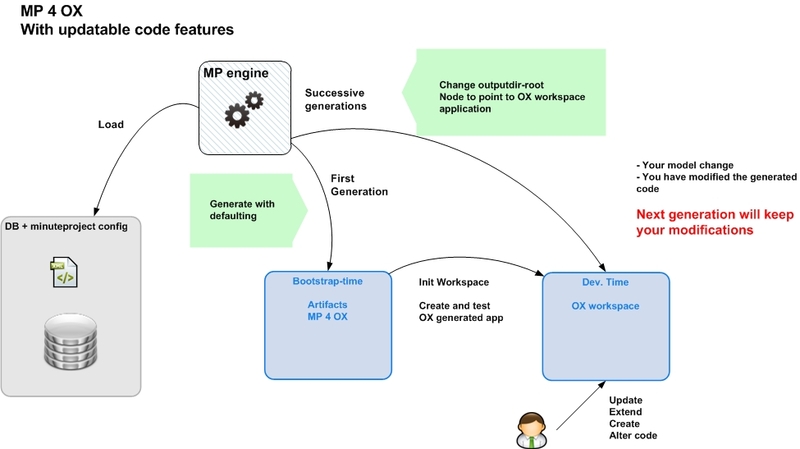 This feature allows you to goes for continuous generation and continuous modification. Both approach are not longer exclusive BUT complementary. IDE to dev, tune, debug.